Nature shows us many examples of “natural enemies” in the wild. Mongooses will take on poisonous snakes without a thought, sea lions will mob up and attack killer whales, and a pack of hyenas will take on a lion three times their size. When you know who your enemy is; when you know you’re just prey pretending to be a predator, you attack without hesitation. Which explains why Trump-era Republicans are lashing out at any black woman they can find, whether it’s White House reporter April Ryan, Democratic Rep. Maxine Waters of California or, now, former national security adviser Susan Rice. Trump-era Republicans hate and fear black women, and they’re convinced that their downfall will be at the hands of a black woman’s pen, policy or protest. On Monday the Republican echo chamber went nuts after a Bloomberg news story reported that Rice, President Barack Obama’s former national security adviser, had “repeatedly” asked to “unmask” the names of Trump campaign and transition officials who were caught on tape talking to Russian spies under investigation. Rice, as part of the investigation into Russian hacking and meddling in U.S. affairs, had every right to ask who was on the other end of a phone call between a foreign agent and an American who might one day be part of the White House. However, Republicans have concluded that this is somehow validation of their Fox & Friends-induced belief that Obama was spying on Donald Trump. Since everyone has already told the administration that the wiretapping story was a lie (even Fox News suspended the guy who said it), let’s focus instead on Rice. Why, out of the dozens of former White House officials involved in the Russia investigation, are Republicans focusing on her absolutely legal requests? For the same reason that White House press secretary Sean Spicer got snippy with Ryan, and Bill O’Reilly came after Waters. Republicans smell their natural enemy. This is not some essentialist “black queen as savior of our men” polemic masquerading as commentary. It’s a stone-cold fact that while many Americans are waking up to the havoc wreaked by less than 100 days of a Trump administration, African-American women, a full 94 percent of them, saw Trump for what he was last fall. That group includes African-American Republican women like Condoleezza Rice. While, at various points in the last 40 years, Republicans have been able to lure black men, white men, Hispanics and white women into the fold with various policy promises, black women haven’t been buying it. They are kryptonite to the Republican Party, especially under Trump. African-American female politicians, journalists and activists are the greatest consistent threat to the hegemony of Trump, and his supporters are triggered whenever a black woman speaks her mind with authority. O’Reilly is afraid of Waters because he knows she is an unmovable force in Congress and can’t be bullied, bossed, bought off or sexually harassed into shutting up. So his only option is to attack her hair. Low-hanging fruit for anyone who hates black women, from Michelle Obama to Gabby Douglas to the U.S. military. Spicer is afraid of Ryan not because she sees through his lies (as most reporters do) but because she is a black woman he can’t control. So he resorts to telling a grown black woman how to manage her own body. 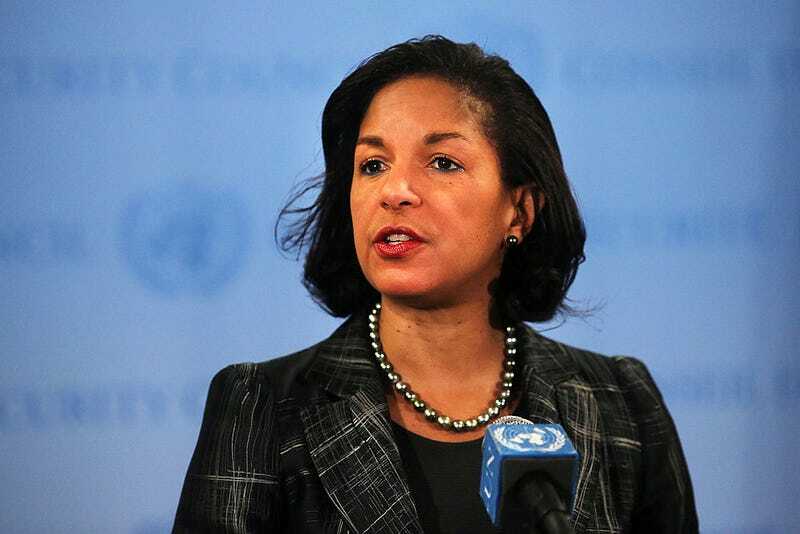 Republicans have hated Rice since the Benghazi “conspiracy” began, and their attacks only brought her closer to Obama’s inner circle (she went from United Nations ambassador to national security adviser, a big step up in influence). If there’s anyone whose congressional testimony might further embarrass this administration, it’s Rice. However, the fear and marginalization of black women under Trump doesn’t just stop at oppositional reporters, administrators and politicians. Omarosa Manigault-Stallworth was essentially undercut by this administration when she was placed as a liaison with HBCUs but Trump gave no extra money to HBCUs in his preliminary “budget.” Utah Rep. Mia Love has been a nonentity despite being the only African-American Republican woman in Congress. And has anybody seen Katrina Pierson? There is little doubt that as this administration continues along, it will continue to target black women through policy and the press. I’m sure that Sen. Kamala Harris (D-Calif.), MSNBC’s Joy-Ann Reid and probably Kerry Washington will be the recipients of mean tweets from Trump or one of his surrogates in the coming years—a strategy that will inevitably backfire locally and nationally. African-American women put Obama in office twice and helped win the popular vote for Hillary Clinton. Trump knows full well that they’ll be at the forefront of resistance elections this fall and next year and will be holding the line against his re-election in 2020.